American Home Guard is based out of Philadelphia, PA and provides service contract plans to repair or replace appliance or home systems. American Home Guard offers three different comprehensive and flexible warranty plans and strives to offer fast, friendly customer support. They offer support by phone 24 hours a day, 7 days a week and their product is backed by a full 30-day Guarantee. Senior citizens and military personnel are offered additional discount. 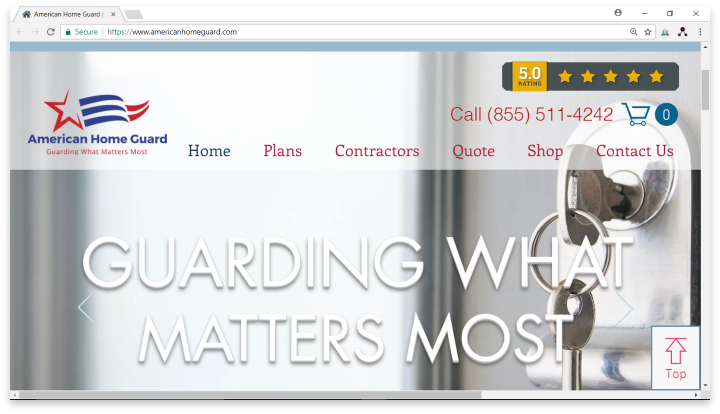 American Home Guard has more than 50 years of experience. They offer a wide range of policies and plans tailor-made to meet their customer's specific requirements. American Home Guard is not as widely known as many of its competitors but has many happy customers. We did have trouble finding some basic information about the company and there is a common theme of dissatisfaction from many verified reviewers. As with any service contract, we highly recommend you read and understand the terms of your contract before signing. You might also want to ask for a list of contractors in your area and check into reviews about them as well. Have you had an experience with this company? Please share your American Home Guard reviews below. Contractor was very professional and helpful. Explained the problem and how long it would take to have air conditioner fixed. Took about a week and have no complaints with service since they had to order a specific part. The service I received from AHG customer department was very encouraging, supportive and understanding. The staff at AHG understood the importance of getting my appliance fixed and they did everything they could to solve the problem in the most efficient manner. Thanks you for a job well done!